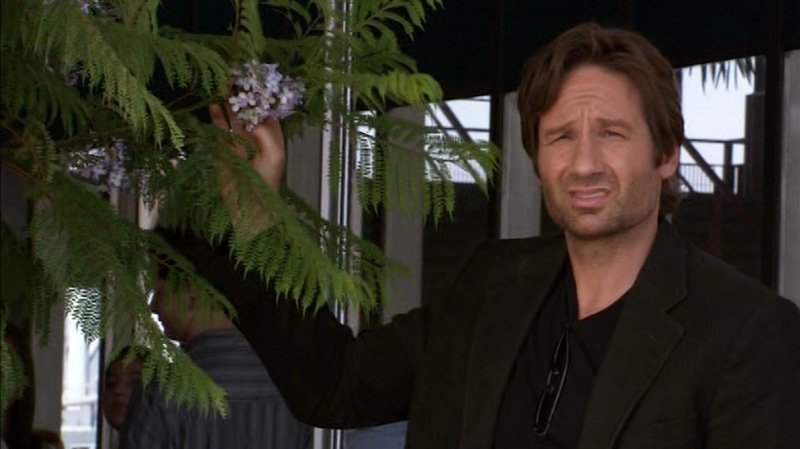 David Duchovny as Hank Moody at LAX in “Filthy Lucre”, the ninth episode of Californication. 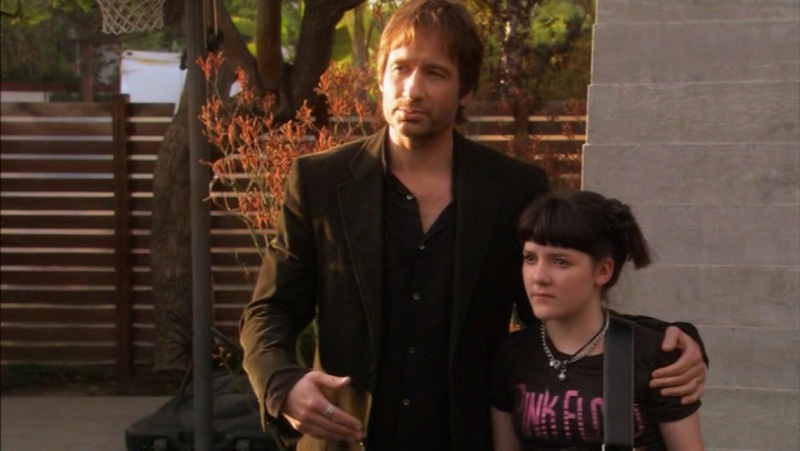 It’s been almost three months since BAMF Style has checked in with Hank Moody, the hero of Californication. In “California Son”, Hank had just come to terms with the death of his father with the help of a roll in the sack with ex-girlfriend Karen. He departs LAX for a brief exodus home to JFK, returning a few weeks later. Upon his return in the next episode, Hank is pleasantly surprised to find Karen waiting outside LAX but soon discovers that she is there to meet boring dial tone Bill – her fiance – rather than Hank. Hank makes the best of this uncomfortable situation. If you’re heading home for the Thanksgiving holiday, take a few style nods from Hank Moody to travel comfortably and fashionably. Hank’s flying attire (in season 1, at least) consists of his staples: his brown smoking jacket, a black shirt, and dark jeans, all paired with Hank’s usual slip-on boots. With modern security regulations calling for the removal of jackets and shoes, Hank’s attire is smart and reasonable. He can toss all of his belongings into his jacket, move it through security, and slip his shoes on and off. In the meantime, the octogenarian in the other line is pulling his keys and coins out of various pants pockets and holding up the line trying to untie his ancient white tennis shoes. Hank’s smoking jacket is his tried-and-true chocolate brown sueded thin wale corduroy sport coat from Yves St. Laurent with a single-breasted 2-button front and notch lapels. There is a breast pocket, but the inside pockets and flapped hip pockets would be best for Hank to store his accessories – including cigarettes, a lighter, sunglasses, and keys – to avoid setting off the metal detectors and to make security check-in a breeze. The jacket also has a single rear vent and 3-button cuffs. Hank looks none too enthused about the prospect of flying. His denim jeans are very dark blue with a boot cut to allow a comfortable fit on the plane and to be worn with boots. Hank never wears a belt with his jeans, making these a practical choice for walking through security. 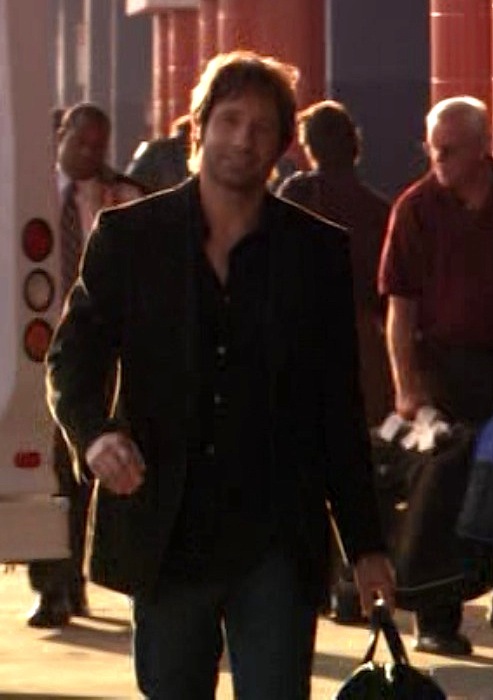 Hank’s shirts are both black – a plain t-shirt for the trip to New York and a rumpled button-up shirt for the return to L.A. The button-up shirt has long sleeves with squared cuffs – that are worn unbuttoned – and a placket-less front. If you want to look a little dressier as you emerge from your flight, opt for a button-down rather than a t-shirt. On his feet, Hank wisely wears his loyal pair of brown Timberland “Torrance” sueded leather Chelsea boots. As a pair of comfortable but sturdy slip-on boots, the Timberlands are ideal for air travel, both casual enough to work with dressed-down travel attire and dressy enough to be worn with a sport coat or suit if traveling to a more formal occasion. A pair of all-purpose shoes like these are wise to give you more space when packing for a trip, since footwear is a very heavy and space-consuming item to include in your baggage. Hank wears black socks with his boots. Hank’s other accessories are his sunglasses, his ring, and his studded wrist strap. The sunglasses are Izod 725, a compact and fashionable pair that folds down to fit into a pocket without creating a bulge or breaking easily. His ring is a silver spinner, worn on his right index finger and a good choice for the borderline-ADD Hank who needs something to play with. Since cell phones and electronics have to be off during takeoff, at least he would have his ring to distract him. You may really want to show off that spinner ring, but make sure you’re off the plane and out of the airport before lighting up a smoke. He also wears his black leather bracelet with silver hexagonal studs, strapped to his left wrist and paired with his usual black braided leather bracelet. Hank travels lightly, with just one nondescript black duffel bag that he’s able to check onto a plane. Personally, I prefer to just carry one medium-sized bag as well, fitting it either under the seat or into the overhead bin; the cost and worry of checking luggage is hardly worth it, especially for shorter trips that don’t require excessive clothing changes. Of course, even for a longer trip you can pack lightly by keeping everything to one major color motif. Before you leave, make sure you take care of a few things around the house. Dump any cups that aren’t full, especially glasses of Scotch used for depositing cigarette ashes. If you’re prone to a Cezanne-like setting with fruit on your table, toss any exposed fruit to prevent mold. These seem like obvious tips, but they weren’t too obvious for Hank. Nobody wants to come home to this. Once on the plane, you don’t want your entertainment to be at the mercy of the flight crew. Sure, you might be able to fit three seasons of Breaking Bad on your iPhone not to mention hours of music, but a) You could run out of battery, and 2) Flights are pretty tough on people with electronics, making you wait until after takeoff and turning it off before you land. The best tip – and one Hank would agree with – is to take a book or two and read. Or, of course, you could sleep. Either way, Hank would say to do it with a cocktail in hand. 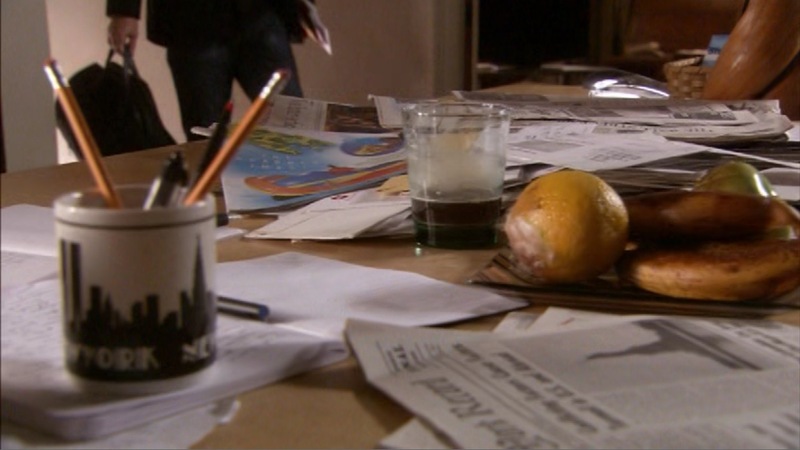 Although unseen in the finished episode, the script for “Filthy Lucre” called for Hank to step off the plane and down a mini bottle of Jack Daniel’s. Hank’s look is a fine option for comfortable and easy air travel. Take hints and make it your own. Buy the first season . Hank: And this is where I think we should part company. I think I see a cab with my name on it. Hank: No, uh, Bill, it’s just a figure of speech. There’s not really a cab with my name on it. As usual, you can find Hank’s bracelets at Urban Wrist.